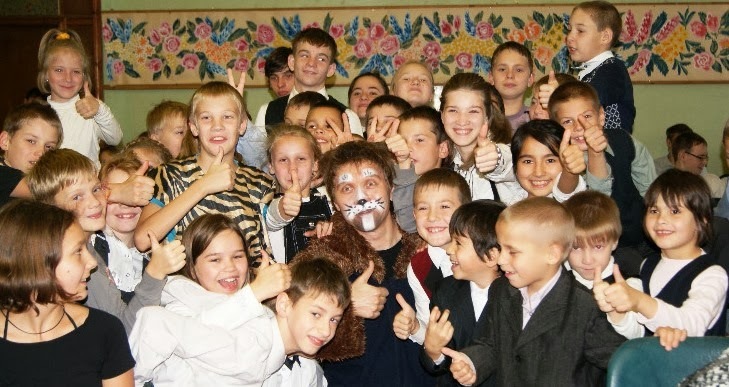 Families for Orphans: Russian orphans learn about kindness from the "KIND CAT"! Russian orphans learn about kindness from the "KIND CAT"! Children at Jukki orphanage with "kind cat"! In all projects the main theme for October was kindness. At the Grace Center graduates' and mothers’ meetings, we spoke about kindness, prayed with the children, and decided that everyone will take efforts to work on his own behavior. We committed, with God's help, to be kind towards one another and with our own children. At Jukki and Luga, we invited the actor-volunteer who was a Cat, and he talked to the kids about the importance of being kind and not rude to the animals. Children loved the idea of helping their neighbor! We talked about two main commandments: to love the Lord our God and to love our neighbor. To love in this way, it is impossible without being kind. Please consider "adopting an orphanage" to support Natasha and Help for Children in the year ahead. Your monthly gift of any size will be a wonderful blessing and encouragement for Natasha and the children! Just click on the GIVE button for more information. When we started to talk to mothers at Grace Center, all of them shared that they didn't experience much kindness towards them in their life. We discussed what will be the right answer in that case, and prayed that God will give us all possibility to forgive. Alisa, the graduate, now lives at the shelter that belongs to the Lutheran Church. It is very small, like our Grace center, and we are very happy for her! She had hard time living at the hostel and wanted to live at Grace, but it was not possible because we have 2 mothers and 2 kids and 2 graduates already. Now God has provided a nice place for her to live, and she is excited to visit us for the activities! Praise the Lord! Please pray for Olesya and Nastya, two graduates who live at Grace. They are having huge behavior problems, and we are working to help them not to make mistakes. In Jukki, we had volunteers from Kadets School in St. Petersburg. They had fellowship with the children from Jukki and had tea together. It was a lot of fun and helps the both sides: It is great for the deaf children at Jukki to get socialized by fellowshipping with children who hear, and it's good for the students from regular school to open their heart towards the problems of disabled children. Thank you to everyone who partners with Big Family for making all this possible! God bless you! Children at Luga orphanage with "kind cat"!